I just came back from an eight-day cruise where we crafted, ate, and had as much fun as possible. I came home, unpacked and was excited to get crafty with some new t-shirts I bought for $8 each. The technical term for this technique is called "discharge dyeing", it's where you use bleach to remove color from fabric, but I like to think of it as "bleach art." 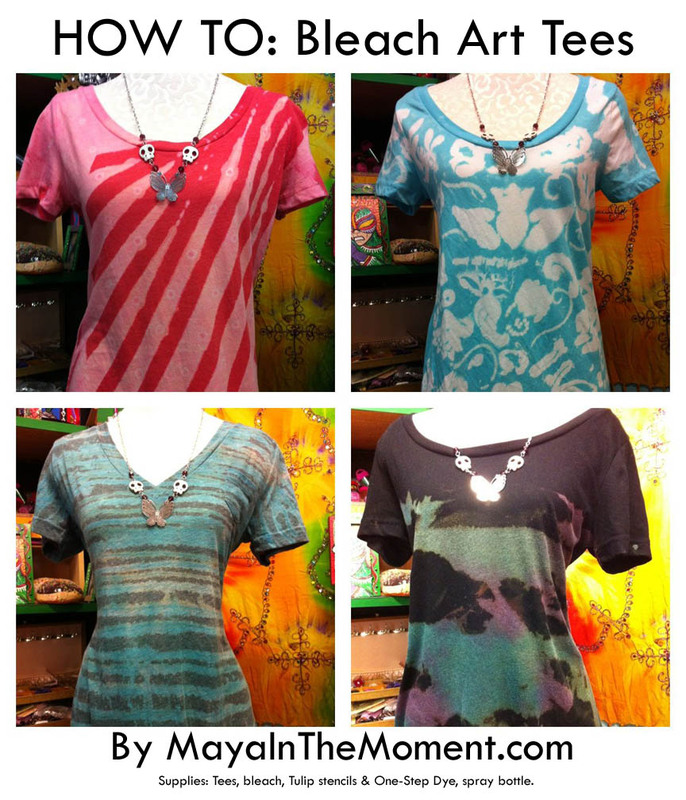 I'm going to show you four ways that I used bleach to design some cool summer tees! Ready? - cotton t-shirts - this is crucial. It has to be at least 60% cotton or the bleach and dye will not grip the fabric. This is what the shirts look like after the bleach has been washed out. you can see how the color is lifted! Now they are ready for colorful dye! 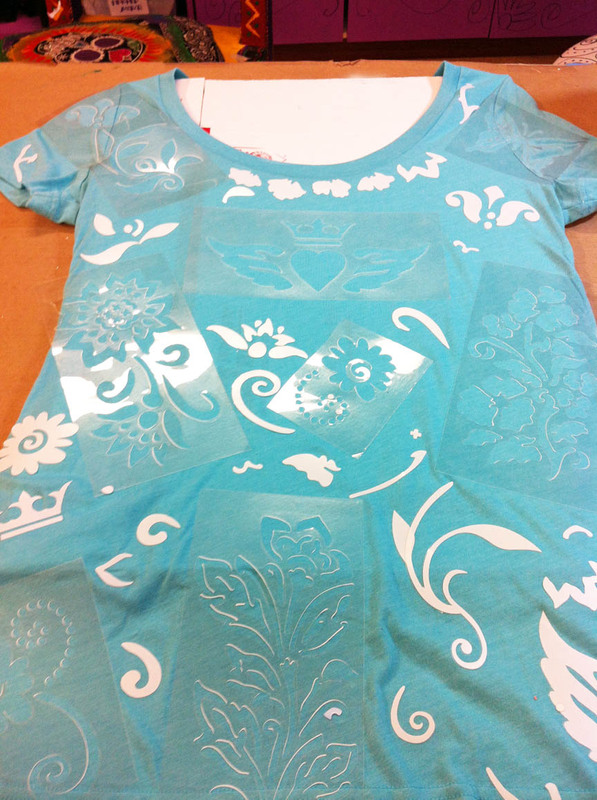 Place stencils all over the front of the shirt. 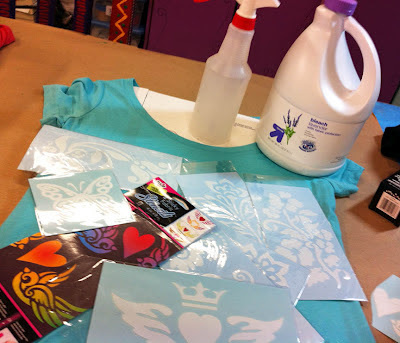 You can use all parts of the stencils! Apply bleach over areas you want lifted. TIP: For a cleaner edge, brush on lightly. I gobbed way too much on, which is why my design is blurry, but I still like it! Let it sit for 20 minutes and then peel away stencils. Wash in cold water and a bit of laundry soap. Hang to dry. Wash shirt and dry. 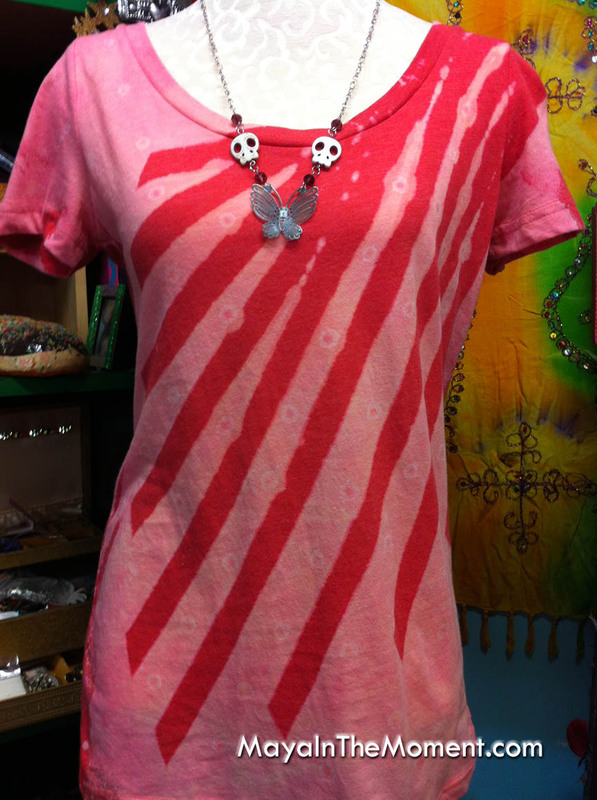 Apply bleach in an extra Tulip Dye bottle and make stripes across the shirt. Let it sit for 20-30 minutes, wash in cold water with a bit of laundry soap in the machine, let dry. 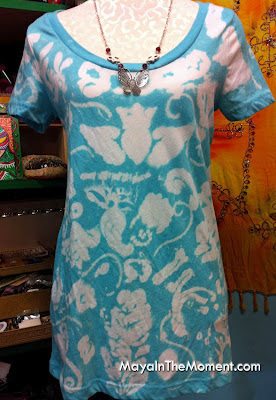 Dampen shirt with water bottle and mix Tulip One Step Dye in teal and mix according the package directions. Apply to the top and bottom of the shirt. Let sit for about 6 hours and then wash and hang to dry. This is one of my favorite techniques! Wash and dry your new black t-shirt. 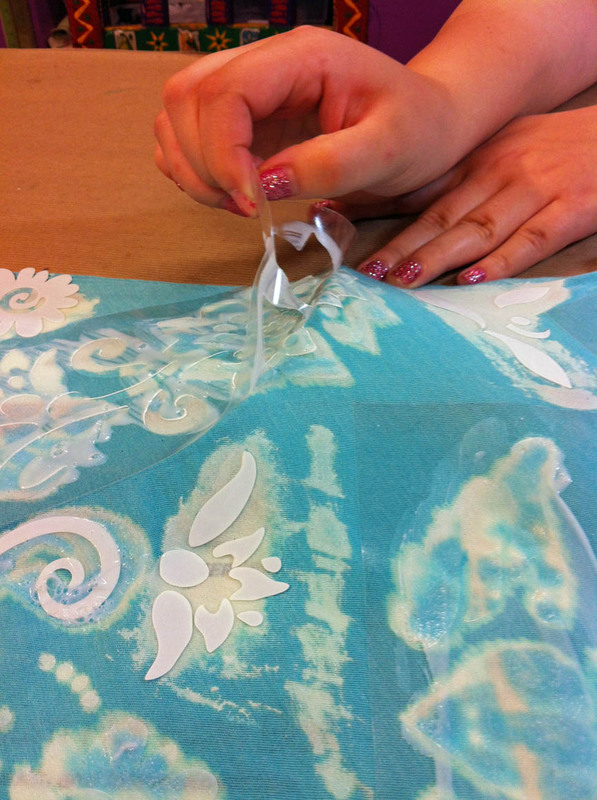 Cover the top portion with a bag or cardboard. Scrunch the bottom. 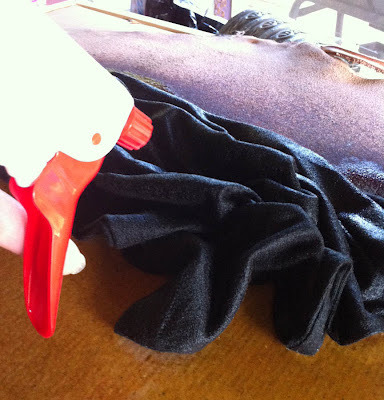 Use a spray bottle with bleach and heavily saturate the black fabric, but don't move it. The color will life to a bronze/orange/grey. 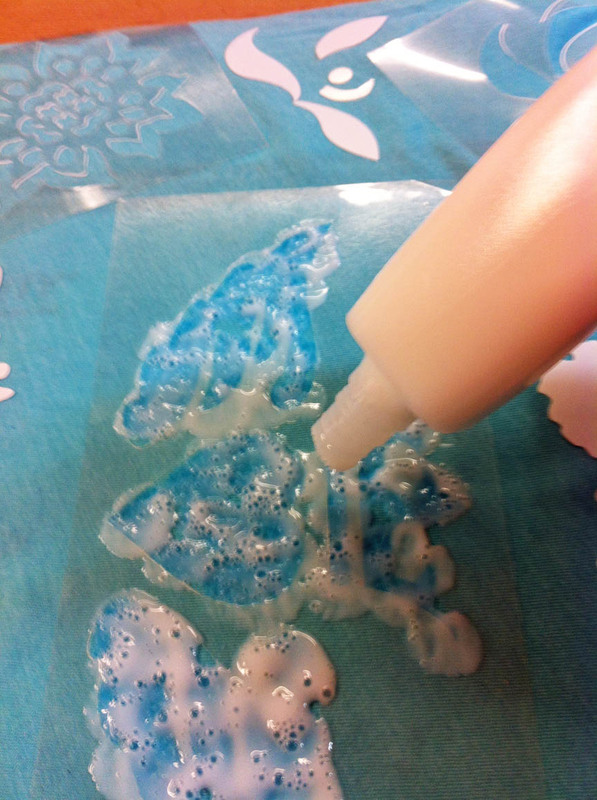 Wash with a bit of laundry soap in your machine and set out flat. 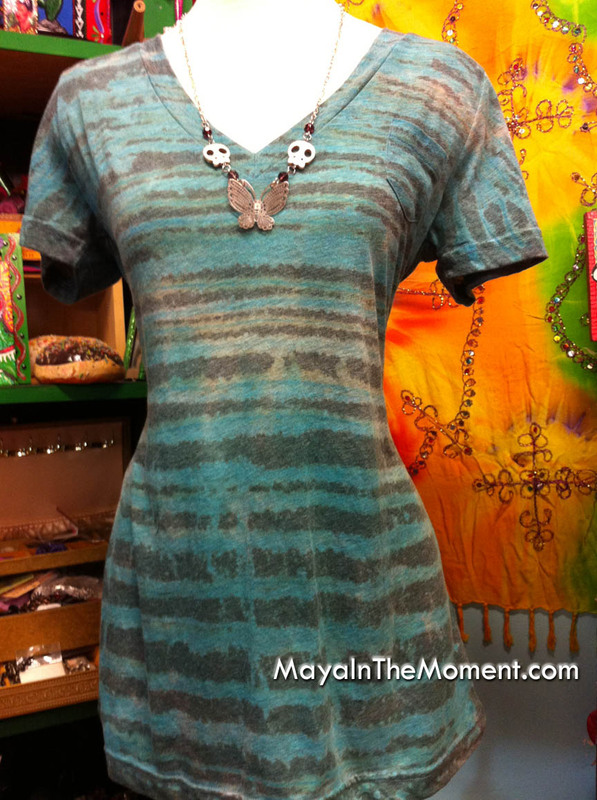 Mix the Tulip One-Step Dye in teal, lime green and purple. Apply to all the bleached areas, randomly. Let it sit for about 6 hours and then wash in your machine and hang to dry. Here it is! Doesn't it look like patina? Use blue painter's tape to make stripes. You can also add dots. 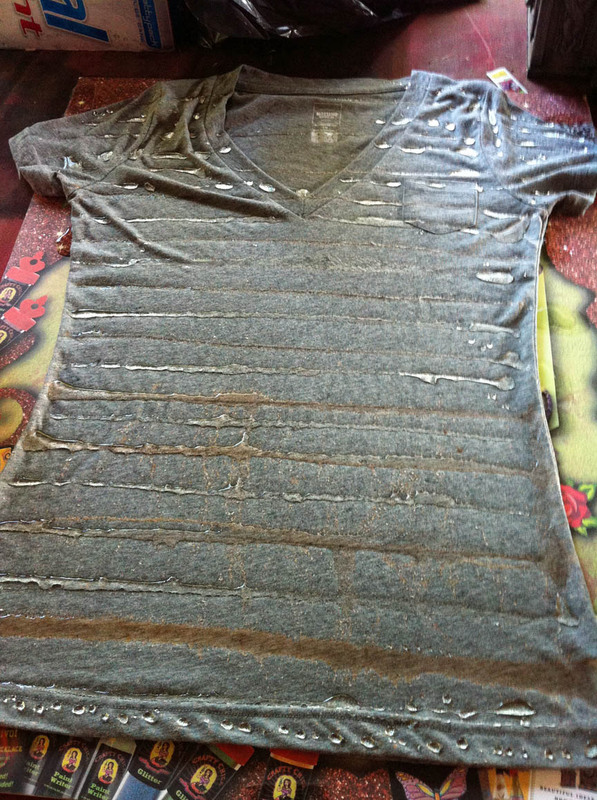 Use bleach in a spray bottle and spray over entire shirt. Let sit for 30 minutes and then wash with a bit of laundry soap in the machine, hang dry. I as going to add dye to this, but after I looked at it, I decided I liked it as is!! I hope you liked my project! Please join me on Facebook http://facebook.com/mayainthemoment - let's share more crafty ideas! i love it! got my bleach pen finally! these are super cute - can't wait to do it, myself ! Better info on your blog than what I have seen so far elsewhere. Thanks for sharing and... Keep up the good work. I know from experience it's not always easy! :-). I love all of these! 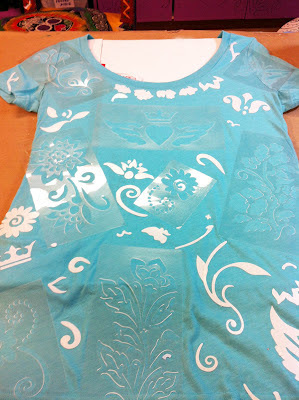 I am trying out the stencil one right now. :) I hope to post it o my blog. If I do Ill let you know! great tutorial!! lots of great pics to SHOW what you are doing...you make it look simple! Will washing this in the washing machine cause any dye to bleed out,where it would ruin future loads of laundry? Should we first wash the item separately in a sink or something? What about the back of the shirts? Does the design go through equally as well to the back or should we put something in the layers?? Love love love these! 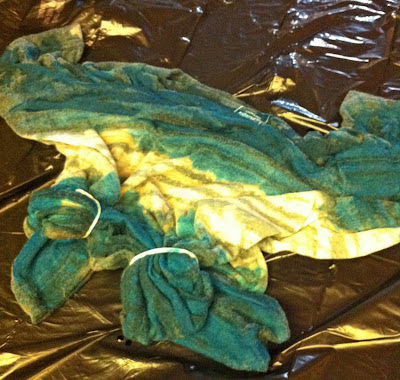 I have been scouring the web for good bleach/dye tutorials and this one by far is the most innovative. Thanks for sharing! Love these ideas. I just bought a couple of plain tank tops and was looking for some bleach art tips. Love the stripes and the stencil ones. I have linked back to your post. Design A Shirt with Your Logo or Slogan Online at whatflop. did you find that the bleach continued to eat away at the clothing after you were done dying them? I love this technique, but recall splashing bleach on my clothing by accident & having it eat a hole thru my shirt. Also - what ratio of bleach to water did you use in the spray bottle? Design and Buy Custom T-shirts, Hoodies, Sweatshirts and more. Choose from Millions of designs or create one, with your own images or text. Bleach can be dangerous, and cause asthmatic reactions in some people. It's always best to work outside and to wear a respirator with an acid gas cartridge. For long life of your bleached fabrics, rinse after bleaching, then soak in anti-chlor for at least 5 minutes. 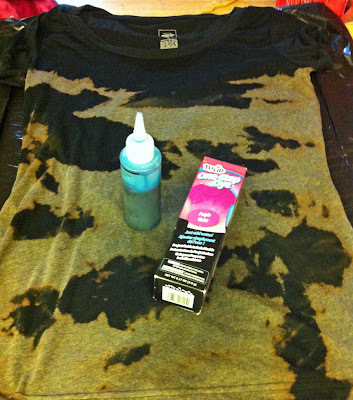 For more examples, see http://dippydye.blogspot.com/search/label/Discharge and stay safe! This blog is very interesting for me. If I talk about the basic motto, afterwards I just said that it was really an awesome. If Someone says to me that to give a percentage to this blog then, I will give 100% because for your design. If are you searching Sweatshirts for Women then, we suggest you that, please visit to our website and get the more fancy t-shirts at more affordable price. All the t-shirts appears different. The letter printed on the t-shirts appear more dashing. 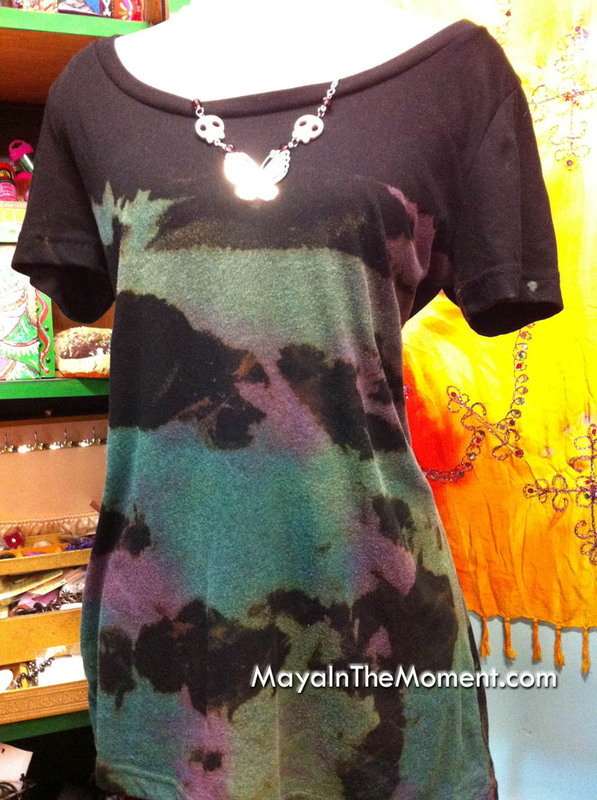 I have never seen that kinds of t-shirts ever, it's a new look for me. We have also other collection of Womens Fashion Clothing, if you want to see them then, please visit to us and get the details. Have bleached dyed shirts before but never thought of using Painters tape or Stencils...Thanks for the great tutorial. Well Done. 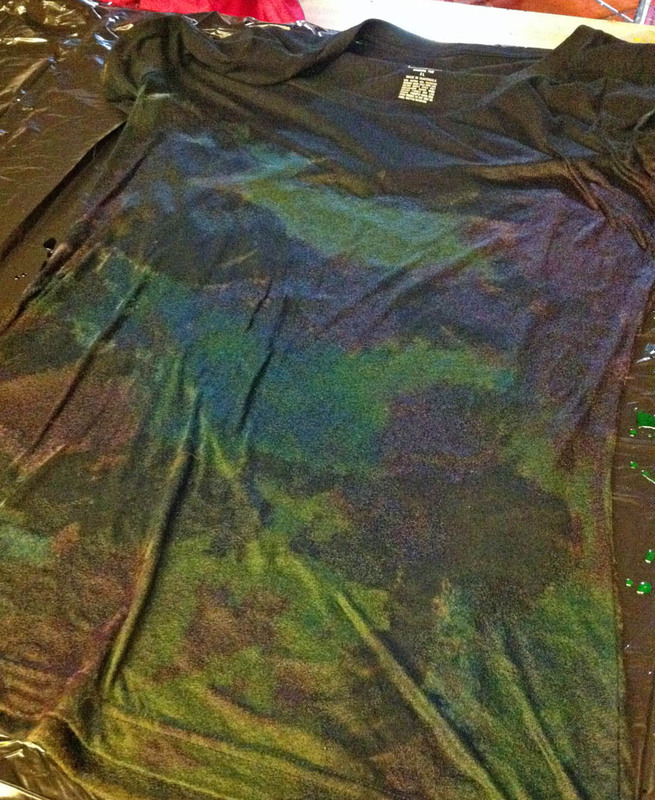 If you have ever dyed shirts, you know that you need to protect the back of the shirt unless you want it dyed, too. I would think you might want to dye each side,front and back , separately. I wasn't too happy with my try at dyeing, but think I might try it again . These are so cool. Awesome stuff! I can't wait to try and experiment with designs for my cyberpunk clothing line. Excellent post! I must thank you for this informative read. I hope you will post again soon. cotton white shirt. If you want to help make more of a mark in the coming years, then having your own personal t-shirt printing services can be hugely beneficial. Very good with effective information and amazing images. I think this is the right place for you!.